Step 1: Prepare the pasta. Put the pasta in salted boiling water, mix and cook for approximately 6-7 minutes. The pasta should be cooked al dente. Drain it and let it cool well under plenty of water. Set aside to drain well. Step 2: Prepare the salad. Put the pasta, the tuna, the caper leaves, the spring onions, the peppers, the corn and the dill in a large bowl and mix well. Step 3: Prepare the mayonnaise. Place the eggs in a bowl, add the vinegar, the mustard, the sugar, the salt and the pepper and blend in the food processor or use a whisk, gradually and slowly pouring in the oil, then the ouzo, and finally the lemon juice. Whisk until the mayonnaise becomes homogeneous. 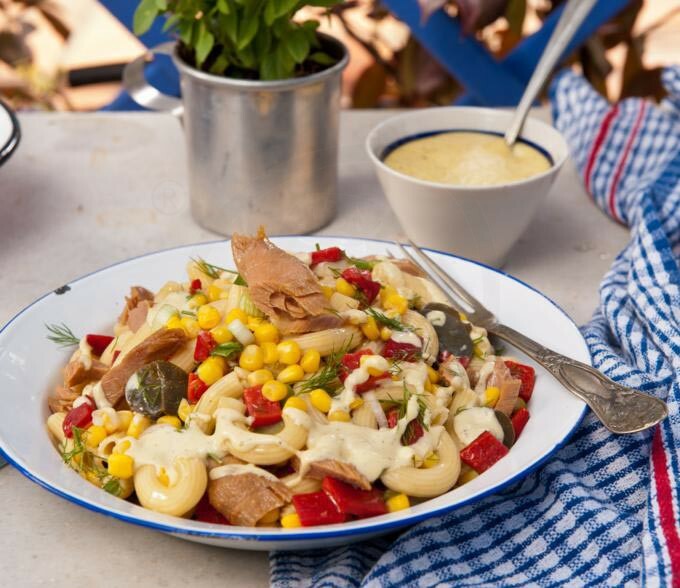 Step 4: Add the mayonnaise to the bowl with the pasta and the rest of the ingredients, and mix. Refrigerate the salad for half an hour until the flavours are combined beautifully together, and serve. A salad with a strong Greek character, served as an appetizer.